a spectacular 25 dollar giveaway and 25 percent discount at mymemories.com this weekend! I am stopping in for a quick post to let you know about an incredible $25 giveaway going on over at MyMemories.com this weekend! By clicking on the link attached to the image above (top of post), you may submit your email address for a chance to win a $25 store credit at MyMemories.com both today and tomorrow. One entry per day, ending Sunday, April 17th. So, you can enter your email address once today and then once again tomorrow! Remember, there are many top-notch designers now selling their creations at MyMemories.com and a $25 store credit shall surely be a welcome surprise for the lucky winners, eh? WOOT, WOOT ... YEAH! You will note, as you are entering your email address, that if you sign up the the MyMemories.com newsletter, you double your chances and you are also eligible to enter a drawing for a free copy of MyMemories.com digital scrapbooking software! How cool is that! Oh, and on top of the chance to win a $25 MyMemories.com store credit, I am able to give you, right here on my blog, a promo code for 25% off any purchases you make this weekend! To receive your 25% discount, enter ADR25MM upon checking out! Good luck y'all and have a gorgeous weekend! chasing pirates and slowing down for a freebie! Phew! I knew the word art portion of my contribution to the April blog train had great significance to me and I was also hoping it would be equally meaningful to most of you as well! After finding a photo for my blog train preview of our grandson, Jace, taken from Halloween last year, I looked at both Jace and his mommy and the lyric from Norah Jone's smooth jazz recording, Chasing Pirates, popped into my head immediately! The meaningfulness of this lyric hit me even harder this past week when my older brother, Albert came to visit for the first time in six years and the two of us drove up the hill to celebrate with Jace on his third birthday last Thursday. This was my brother's first time to meet his grandnephew! I sat admiring my precious grandson, balloons in hand, as he literally ran in circles in the living room as most any active little boy would be prone to doing! Jace was donning a cute pirate t-shirt to which I remarked, "I really like your pirate shirt Jace!" Without hesitation and still tracing circles with his tiny feet, Jace exclaimed, "I like it too!" *sigh* Be still my grandmother's heart. He is growing up so very quickly and speaking like a little adult. When asked about his bulldozer, he was quick to point out that it was not simply a bulldozer, but that it is an excavator! Oh my. It was not so very long ago that I was cradling him in my arms and welcoming him into the world! I have a very good feeling that our grandchildren shall keep us both mentally and physically challenged as time goes on ... and that my friends is a good thing! I've been away from the computer for a week now, with the exception of an hour or two on Friday, and while I've not spent all of that time chasing pirates, I have had the pleasure of a visit from my older brother for the first time since 2004. Albert (our father's namesake) is one of my two older brothers with whom I was not raised, have seen face-to-face less times then I can count on both hands and who lost his wife of 40 years to breast cancer June of last year. darling little pirate with the camera on this wondrous day of celebration! LOL! Hope to find everyone enjoying life's precious moments and scrapping each and every one of them to your heart's content! 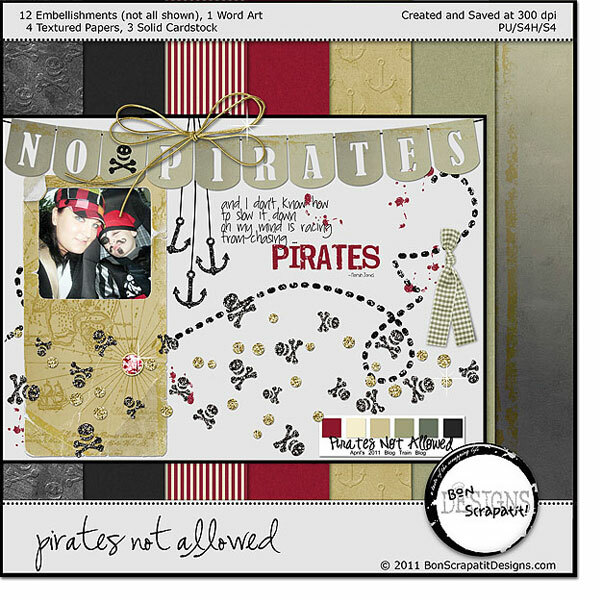 no fooling y'all, the april blog train "pirates not allowed" has departed! It's the first of April, can you believe it? My head is spinning with all the family events we've had going on the past month or so and we are not finished yet! Hope to find you enjoying the new season wherever you may be! For us it is spring and for some of y'all, it's fall. 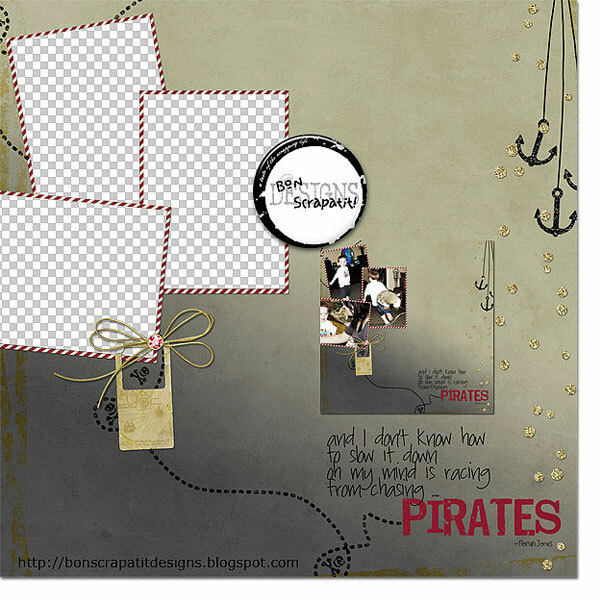 No matter which, the April 2011 Blog Train, *Pirates Not Allowed* has something for everyone! So climb on aboard and visit each stop for a different and unique download from each one of over 100 talented designers! Here is a glimpse of most everyone's contribution! Mine did not make it ... oops! I had to chase the train down the track and jump on board! LOL! Would you believe I was this close to publishing and we lost our power for several hours? All those storms and no power outages. Day number two of gorgeous weather and zap! ROFL! I would love to see you what you do with my designs here in the Bon Scrapatit Flickr pool (gallery)! I love me some eye candy! *squee* Stay-tuned for a chance to win a gift certificate for posting to the pool!